D = fdesign.differentiator constructs a default differentiator filter designer D with the filter order set to 31. D = fdesign.differentiator(SPEC) initializes the filter designer Specification property to SPEC. You provide one of the following filter entries as input to replace SPEC. These entries are not case sensitive. Specifications marked with an asterisk require the DSP System Toolbox™ software. By default, fdesign.differentiator assumes that all frequency specifications are provided in normalized frequency units. Also, decibels is the default for all magnitude specifications. Use designopts to determine the design options for a given design method. Enter help(D,METHOD) at the MATLAB® command line to obtain detailed help on the design options for a given design method, METHOD. D = fdesign.differentiator(specvalue1) assumes the default specification N, setting the filter order to the value you provide. D = fdesign.differentiator(...,Fs) adds the argument Fs, specified in Hz to define the sampling frequency to use. In this case, all frequencies in the specifications are in Hz as well. Design a 33rd-order FIR differentiator using least squares. 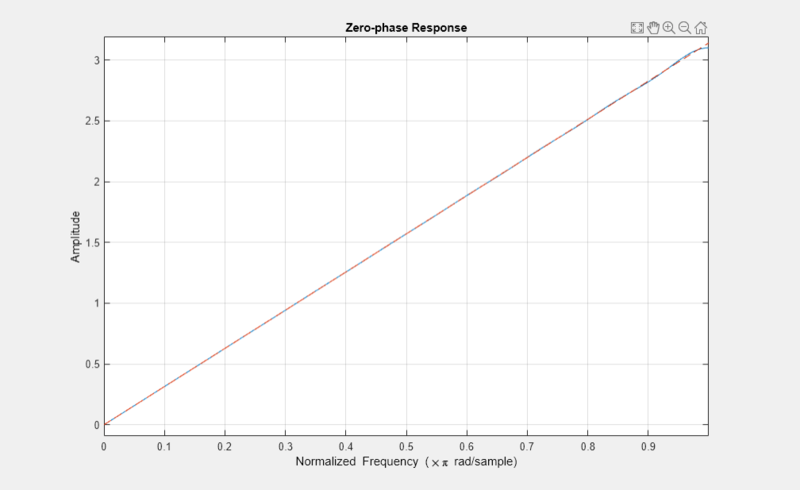 Plot the zero-phase response of the filter. Design a 54th-order narrowband equiripple differentiator. 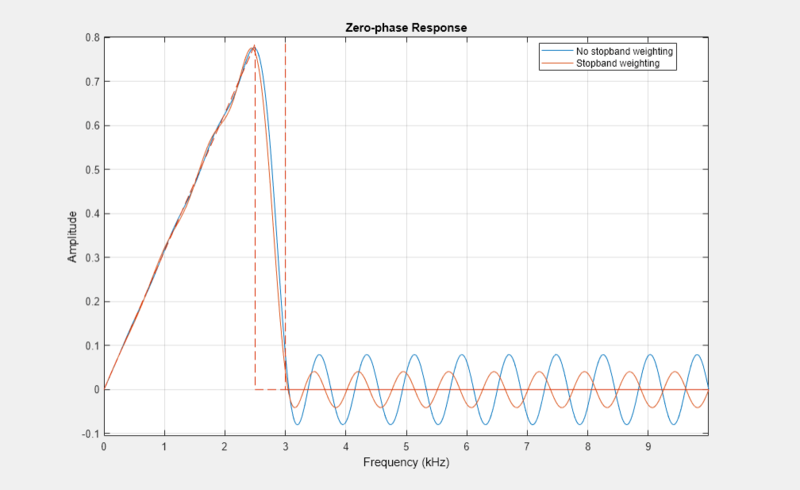 Differentiate the lowest 25% of the frequencies in the Nyquist range and filter the higher frequencies. Specify a sample rate of 20 kHz, a passband frequency of 2.5 kHz, and a stopband frequency of 3 kHz. Redesign the filter, but this time weight the stopband to increase the attenuation.